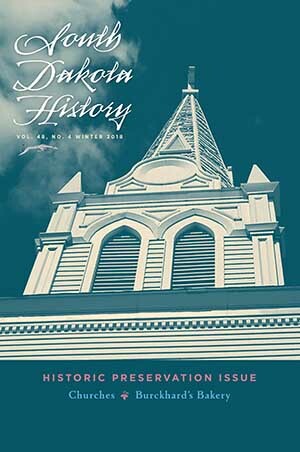 In an article entitled “‘In the footsteps of the pioneer’: Ethnic Settlers and Their Churches in Brown County,” Brad Tennant explores ethnic community building in the late 1800s and early 1900s. New immigrants tended to settle together based on their ethnicities, and for many, the church became a central space to gather and create a new community. In Brown County, this connection led to the listing of four churches—Norwegian, Swedish, Finnish and Welsh—on the National Register of Historic Places. Tennant is a professor of history at Presentation College in Aberdeen. “Burckhard’s North Side Bakery of Aberdeen: A Community Staple for Four Generations” by Robert J. Couser illustrates the influence that one immigrant family had on the development of the town. German Russian immigrants Paul and Catherine Burckhard opened their Aberdeen bakery in 1906. Over the decades, the Burckhard family adapted their products and practices to keep the business viable into the late 20th century. Couser grew up in Aberdeen and is a former director of the newborn intensive care unit and neonatal research at Minneapolis Children’s Hospital. An excerpt from “Early Churches in South Dakota: A Lasting Legacy” by Robert W. Sebesta highlights the churches that played a role in the lives of American Indians. Having begun as mission churches, they intended to convert and acculturate those who had known entirely different ways of life. Several of the structures remain in use today. Sebesta grew up in Sioux Falls and taught computer science at the university level for more than 30 years.